Learning to listen to yourself and giving your body, mind and soul some much needed love and care is an important part of living your best life. I was thinking a few days ago how incredibly different my life is and in ways I never expected. In some ways better. In other ways it’s just different. Funny how life happens that way. It wasn’t until I changed my go-go-go and do-do-do mindset and slowed down that I realized some of my habits were counter productive and counter intuitive and not conducive to happiness. After deciding I needed to make a change a journey was set in motion. A journey traveled with amazing, kind and loving people, with twists and turns, struggles and joy. Talk about ah-ha moments along the way. I realized I was the only person noticing imperfections, a state of constant hurriedness can begin to feel normal, but it’s not, I need more than 5 hours sleep, and if I eat intuitively nutrition falls into place. I realized I was projecting [operative word being WAS] my expectation of unattainable perfection of myself onto others. Surely they expected me to be perfect. Right? NEWS FLASH! I was the only one that expected me to be perfect. I have learned that with time and consistency self-care stops feeling like a plan or a checklist and becomes intuitive. It becomes a habit to check in with yourself and give your body and mind what it needs when it needs it. We all get caught up in life at times, and self-care is given very little thought. In the busyness of life we don’t give ourselves a break, loving care or much needed space. I looked back at how I began creating a self-care plan and one of the first things I did was to decide what self-care needed to look like for me. What areas of my life could use a little attention? Bring an awareness to your body and mind’s need for a little TLC. Download the guide below and use the questions as a starting point to get yourself thinking about your self-care and what your needs are. Add questions to the list that are applicable to you personally. Once you start thinking about it, your self-care needs will become clear. Answer these questions as a guide to finding your answer. Do you feel guilty about the things you don’t do? Have you noticed changes in your appetite and/or an increase in cravings? Do you rarely, if ever, make time to do what feels good? Do you laugh and smile regularly? Are you uncomfortable with being alone? Do you take the time to tune into your body and mind’s needs and make those needs a priority? Do you surround yourself with people that make you happy? Is the little voice in your head criticizing? Do you wake up ready to start the day with energy or dread? Do you go to bed exhausted, but have a hard time falling and staying asleep? Do you spend all of your time caring for other people and giving little thought to caring for yourself? Do you go outdoors just for the joy of being outdoors? Do you feel like joy is elusive? Do you beat yourself up for mistakes? Does everything feel like a chore? Do small things feel like big things? Are you in a constant or frequent state of overwhelmed? Are you stressed more days of the week than not? Do you frequently focus on wanting more, bigger or better? It’s not selfish to love yourself, take care of yourself, and make your happiness and well being a priority. When you take care of you, you will be better able to take care of other people in your life. Maybe it’s time to check in with yourself and include a little more self-care in your life. Download the self-care guide below and get started. The quote? Hang it where you can see if often. It’s a great reminder of how important self-care is for yourself and the people in your life. Do you know when you need more self-care? What does self-care look like for you? I have some unhappy disks in my lower back that are a great internal alarm to let me know when I need to take it easier. (Isn’t that a positive spin?!) So, in a way, I’m thankful. Don’t know how I’d slow down otherwise – SOOO Type A! Oh boy, Jill, do I need this. I just went through those questions and it is so clear. Now if I can just find the time for some self care! Absolutely what I needed to read right now. Thank you! Great reminder! As a new mother, I rarely find the time to take care of myself when that is exactly what I need! I love this post because self care is so important to our health! I would definitely need a self care plan to go a long way. Being a mom of 2 small kids it is very important for me to have sometime for myself and I need to make a plan on the same! I understand this all to well. I often leave my own self-care last due to worrying about my responsibilities as a mother and wife. I love this post! 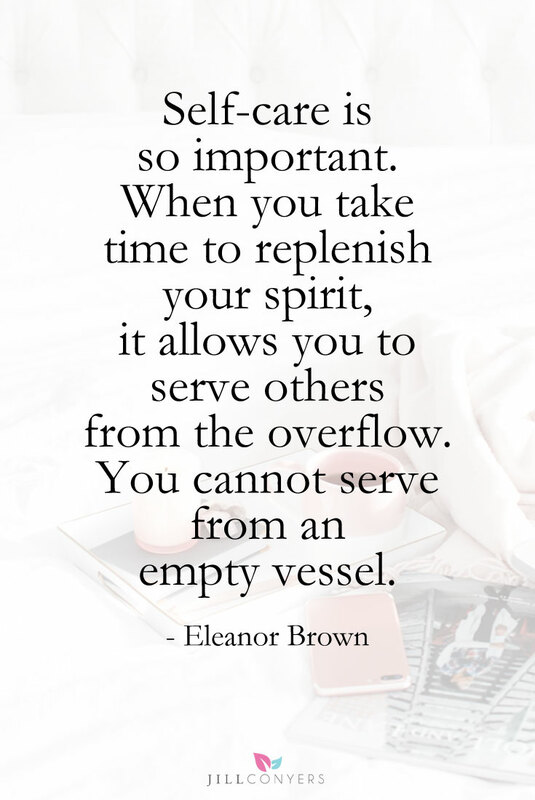 Thanks for the reminder of the importance of self care! A lot of us forget about ourselves when we start becoming occupied with life. We forget about giving ourselves time to breathe and relax which in return makes us feel exhausted and burnt out. These are very good self care plans and it would help a lot to have these printed. This is a good reminder for us all to also take care of ourselves. Oh Jill <3 This speaks to me on a deep level! Self care and self love have really been lacking from my life this year and I am feeling the affects! 🙁 Thanks so much for sharing this! I am so curious about the tittle, nice points. I think we need to spend some time on how we are going to take care of ourselves. I could say yes to a lot of these questions you asked. I know I need to take better care of myself. I am always doing for others more than myself. This post is one of a kind! Something I really needed to read to be honest! There is so much more to life than responsibilities and commitments and once we forget about taking care of ourselves we will start feeling down. It’s important to take care of ourselves and have some time off where in we’re just there to cater to our needs as an individual. These are very good tips on how to take care of yourself. Self care is very important. It can be hard to find time now that I have two littles, but I manage to squeeze some in. I never realized it but apparently I do need a self-care plan. I am usually a pretty happy person but I don’t take time for myself like I should and spend way too much time feeling overwhelmed. I have recently discovered a lot of happiness in my life. I have to say that there was a time when I felt that it was hopeless, but now life is good! I could definitely take a little bit better care of myself. I do tend to wake up with a little bit of a hang over lag from the day before. This is the first time I am hearing of a self care plan. Very informative. Great article. I’ve been non stop recently and I need some self care attention. I’m looking forward to reflecting more, -! ; taking time for myself! I love this! I do need to come up with a self-care plan. I feel like everyone’s answer to all these should be yes. I know so many people who can use this, but time is just hard. So helpful! This topic is huge for me, as I have a family member on the autism spectrum — hugely draining! Thank you for helping me focus on caring for myself. I know I need a self-care plan, and have worked meticulously to get one…but my problem now is that it seems I am thwarted at every turn…I am trying to figure out some strategies so I can still have those fringe hours. I will be honest I feel like this list is targeted to a lot of women. We always feel like we are superwoman whether we are working moms, stay at home moms, career women, etc…we feel guilty if we do stuff for ourselves. We should we should always be seeking ways to enhance our own self-care/love for a better lifestyle. I need a self care plan! I answered all your questions and it is rather sad. I need to start planning a vacation. I need more self care right now. I’ve been trying to add more in. One of my goals this month, for sure. Such a great post. Looks like I need a self-care plan! It is super easy to put yourself on the back burner, as a mom and business owner, this is my issue! I need to take better care of myself all around. Ugh – enough for beating ourselves for making mistakes. I mean – this is a NORMAL part of life. Wish I were better with this too – but for all we need to give ourselves a break. Right? My big AH-HA! moment was when you said, I was the only one who expected me to be perfect. Good grief, that is so true, of me, as well. I need a poster of that! Hi Terri. that realization has been one of my biggest ah ha moments of 2016. It has totally changed my mindset. Have a wonderful day! I think we all need a self care plan, but sometimes it needs an overhaul! I’m stressing about my plan when the new baby arrives. It’ll be so important to my health too. Like you, I had to take a step back a few years ago and realize that my perfectionist mindset was making me unhappy. Instead of trying to be Supermom, I decided to give myself permission to put some of my own priorities first. It has made me happier and that has translated into a better family life….mommy isn’t so stressed all the time. Self-care is definitely important! So true- you really can’t help others unless you’re helping yourself! Self-care is so important for everyone. It starts for me with unplugging and being more mindful of where my focus is. My notion of self care seems to be going down the drain with every year that passes. I am now hoping that I can improve on that and create a plan . A self care plan is important especially if you feel overwhelmed or stressed out with everything that you do everyday. It’s good to take a break and grab some time to assess yourself and how you’re feeling with all of these. I don’t have a problem with these ever since I started doing yoga and meditating. It helps me to center myself and let go in the evening. I definitely always feel guilty about what I think I “should” be doing or have done. I find I get even less done when I get held up with this idea. I would probably increase my productivity and ability to enjoy the moment, if I took more time for self-care. Thanks for the great thinking points! These are good points. I often find that I harder on myself than anyone else would ever be. I love to spend Sunday afternoons watching my favorite tv and relaxing to destress. I loved reading this list Jill. So much food for thought and self-reflection. Everybody is in need for self care, some people more, and some people less than others, but it’s essential for everyone. Thank you Ilka. It’s amazing what we can learn if we slow down a little, listen to our body and reflect. Have a wonderful day! I totally agree Abbey. It might be hard to realize at first but self care is one of the best things we can do for the people we love. Thank you for sharing your thoughts. I have recently realized this is exactly what I need, I need to take some time for me so that I can be better to take care of everyone else. This is a great list. Self care is very important and I only learned about it recently. Everyone needs a self care plan. It is scary how people don’t take the time to care for themselves. Failing to do so will lead to some horrible consequences. So important and “Nobody is expecting you to be perfect except you” is something I need to remember. I just recently started to say no and try not to expect everything but still trying to find that balance with life. Hi Sarah, that realization was one of my biggest ah ha moments of 2016. It has totally changed my mindset. The balance can be tough to find but if you start with your mindset it’s easier and so so worth it. Have a wonderful day! Self care is something i feel us women tend to ignore. We should really pay more attention to it. That’s true Rebecca. Women tend to put everyone else first. But, I believe, for different reasons, men do not make self care a priority either, but typically self care conversations tend to center around women. Thank you for sharing your thoughts. Realizing that you don’t have to be perfect for everyone else is really something that I struggle with as well. Hi Deborah, mind if I ask, did you feel like everyone had an expectation of perfection from you? Realizing the only person that expected perfection from me was me was an ah ha moment that has totally changed my mindset. This is me for sure! I definitely need to work on a self-care plan!! Hi Angela, have you created a self care plan? I have a post coming for creating a self care plan with the info from the self care series. Have a wonderful day! Hi Kerri, good for you starting a self care practice! That is awesome. Yoga or meditation, if I’m teaching yoga later in the day, are at the top of my morning self care routine. That one thing has made a big difference in my stress level at work. This is a great question sheet about self care. It actually brings so much awareness. By answering those questions, I was realizing things about myself I hadn’t thought of before! Hi Sarah, if we slow down even for just a few minutes it’s amazing what we can learn. So many of us have a go go go mindset it’s not always easy and we don’t do it as often as we should. YEP need a self care plan. With a 2 month old and a 2 year old, I’m stressed and stretched to my limit right now. Thanks for reminding me to put me first sometimes 🙂 I realized I REALLY need to! My recent surgery has me practicing self care by force. I’m not happy about it as I have school and work still to do but I’m trying to slow down so my body can heal. At least I’m trying, right? Hi Megan, in our go go go society many of us have created a mindset to match. That makes it so much harder to slow down even when we know we need to. All we can do is try. And try again if needed. It might be hard to imagine but self care can become a habit. I take an epsom salt bubble bath about 4-5 times a week to really relax and also help my muscles recover from tough workouts. Have you done a post yet on ideas for self-care for the mind, body, and soul? I’d be interested in hearing some ideas! Hi Kayla, I’m a huge fan of epsom salt baths. I have this post http://jillconyers.com/2016/09/self-care-routine/ for self care ideas and another post coming to continue the self-care series. selfcare for me this weekend looked like putting everything on hold while i went to the gym and sat in the hot tub and sauna for 20 minutes each to try and relieve some back pain. not doing anything about it would have been bad for my health and i would have been cranky all weekend long. i am a huge believer in self-care! Glenneth that is self care defined! In our go go society it can be tough to put things on hold but that’s exactly what we need to do from time to time.